What makes a good Dutch apple pie? 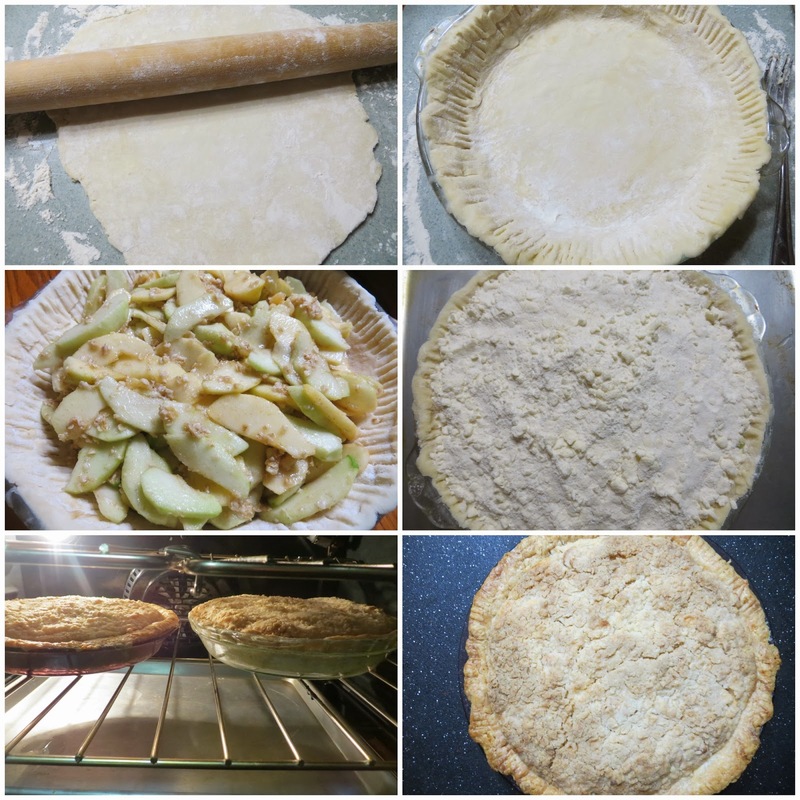 The best pie for me consists of homemade crust; a combination of Granny Smith and Gala apples; my secret ingredient for the filling and a nice streusel topping to crown the glorious pie. I hate crusts which tastes like cardboard and flavor is almost non-existent in the filling except for sugar. And the best way to achieve all three categories is to make my own pies-as always. 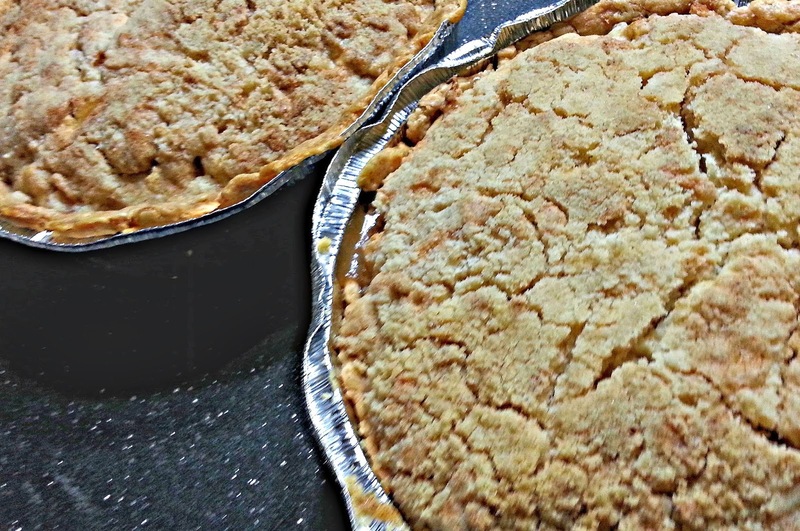 Actually, I made these pies for Ms JC who's taking a vacation and I thought it would be a nice sendoff for her. A week before that, she told us how she was craving for Dutch apple pie one night. So bad that she even thought of getting one from a local bakeshop just to appease her craving. But thankfully, someone was able to dissuade her from doing so and she settled for apple crisps which of course didn't have the buttery, flaky crust but just enough to calm her down. So I told her she'll have it on her last day at work and I was true to my words. I had the pies in a brown bag on her desk when she came in for work. I even baked them in aluminum pans to make them thicker. My Pyrex pie pans are a tad shallow and will not give the pies that tall and proud look. These were shared with the gang with scoops of vanilla ice cream and I got rave reviews. 1. Cut the sticks of butter into 1/2-inch cubes; should be thoroughly chilled. 2. Combine flour, salt, and sugar in a food processor; pulse to mix. Add butter and pulse 6 to 8 times, until mixture resembles coarse meal, with pea size pieces of butter. Add ice water 1 Tbsp at a time, pulsing until mixture just begins to clump together. If you pinch some of the crumbly dough and it holds together, it's ready. If the dough doesn't hold together, add a little more water and pulse again. 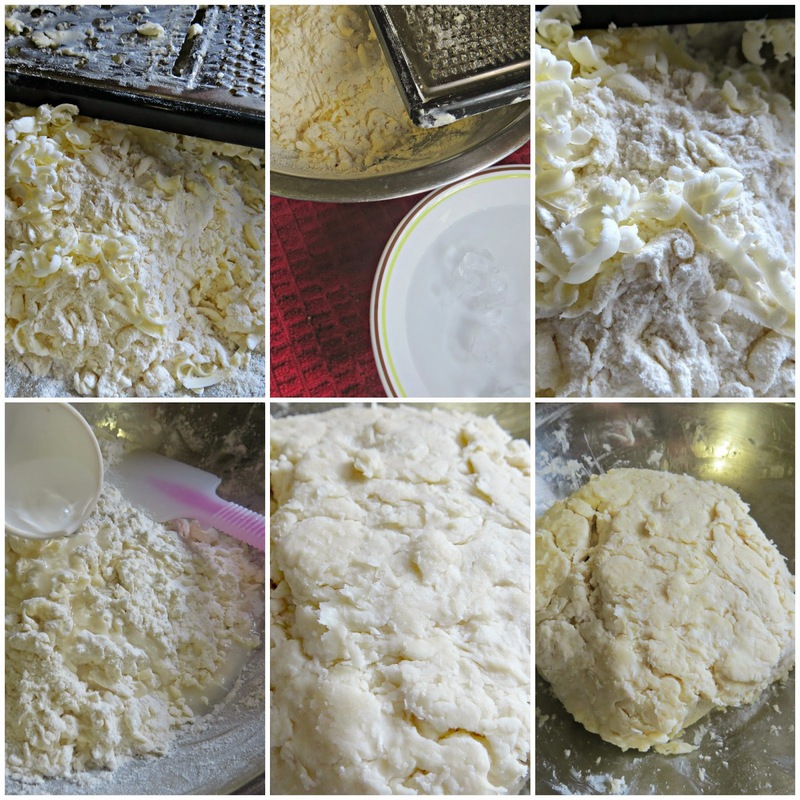 Note: I used a different method which is grating the frozen butter and just tossing it with the flour. Then I used a rubber spatula to stir the mixture with ice cold water as seen on the pictures on top. The filling is a combination of green apples and Gala or Fuji apples. 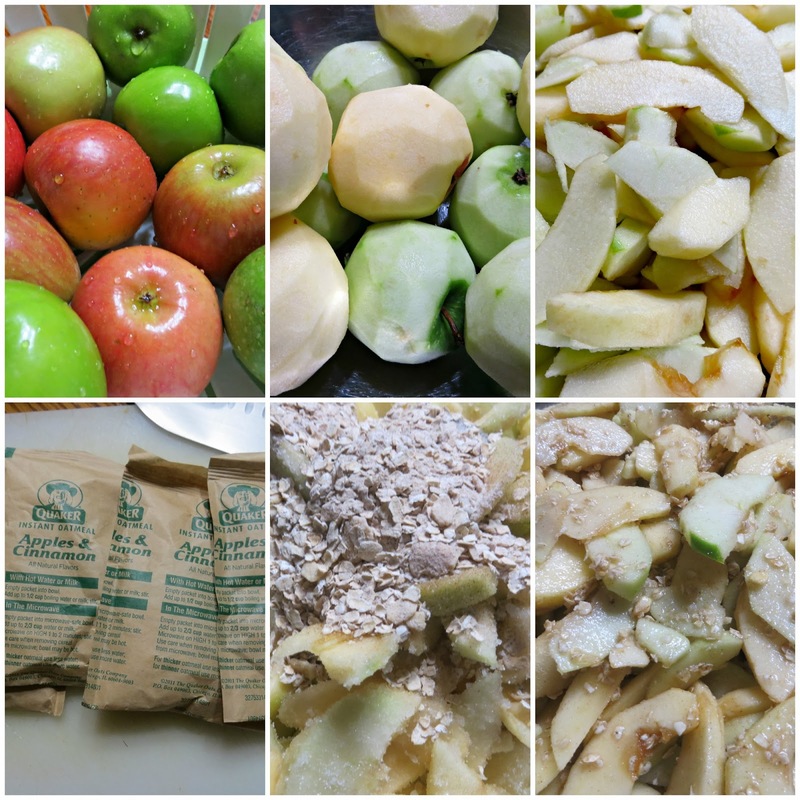 Just peel, core and slice thinly; toss with granulated white sugar and my special ingredient- apples and cinnamon oatmeal. I don't even have to add cinnamon and the oatmeal binds the apples together on top of its health benefits. Using a floured rolling pin, flatten the pie disc on a lightly floured surface into a 14-inch circle. Carefully fit into a 9-inch deep-dish pie plate, gently lowering dough into bottom and sides of pie plate without stretching. There will be a 2-inch overhang all around which you can gently press with a fork or your fingers for a decorative pleated like finish. (Maybe you’ll do a better job at it coz’ mine is not pretty at all J Refrigerate until firm before assembling- I would put it in the freezer to make it quicker. When ready, just scoop the prepared apple filling and pile into mound starting from the center of the prepared pie crust. Top with the prepared streusel topping making sure to do it evenly. Bake for 10 minutes then reduce the temperature to 350 and bake for an hour or until the top becomes light golden. that's such a nice send off Faye, wish my co-workers were just as generous with their (good) baking! Thanks! I love my meatballs moist and tender and at times, I'd fill them with mozzarella cheese. Sure there's a way to keep them from crumbling. I have a recipe somewhere here if you could search for it in the archive. If not I'll update my post with the recipe later. You can find the recipe in an old post "happiness is a bag of flour" or just check the meatballs label.